A common story told on the streets of Charleston is that the rope motif carved into doorways symbolized that the house belonged to a merchant. Who makes this stuff up!? The rope motif has been added as a decoration since ancient times, and is nothing more than elaboration and fine craftsmanship. Common motifs around doorways include acanthus leaves, fanlights, and coffering. To compare it to the rope motif stories, it would be just as accurate to say that these indicated the homeowner was a gardener, a chandelier-maker or an undertaker. 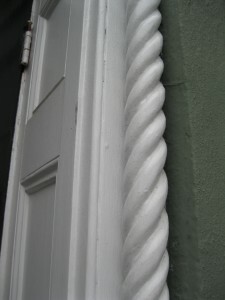 The rope-like detail is a sign of excellent workmanship, nothing else, and it can be found on many houses around Charleston whose original owners were not merchants and whose homes were never used as businesses. Merchants did displayed symbolic signs historically, but these hung as shingles from iron brackets. Charleston had shops that displayed “the sign of the black horse head” for saddles, etc. ; “the sign of the Franklin head” for a bookstore, the “sigh of the golden mortar” an apothecary: and, “the sign of the hand and ring” for jewelry. It’s all easily found in 18th century copies of the South Carolina Gazette. 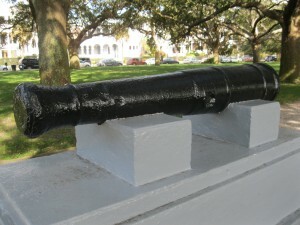 The iron cannon at the West end of White Point Garden was once part of an historic battle in Charleston. No, it wasn’t the battle of Sullivan’s Island, or the firing on Fort Sumter, but the Battle of Longitude Lane. During construction of the old Tyler Cotton Press that opened on Longitude Lane in 1853, a Revolutionary War cannon was unearthed – a British 4-pounder. The old cannon barrel was put back into service as a barrier to cotton drays sneaking down the lane from the narrow East end. By placing it muzzle-down in the middle of the 11-foot lane entrance, the old gun guaranteed that cotton wagons would have to use the lane’s West end and not rub their axles against property on the narrower East side. In 1933, city officials used their usual tact and diplomacy to abruptly take the cannon and move it to White Point Garden as a public display, justifying the move by saying it was on public property, and thus belonged on the city. This did not suit the folks living on Longitude Lane, who besieged City Hall with complaints and threats of legal action, in what became the Battle of Longitude Lane. Predictably, the city won and kept the cannon, which is in a spot barely noticed by the public today, while back at Longitude Lane, the graceful space was replaced by a masonry post that gets considerably more scrutiny. Charleston is graced by a considerable amount of brownstone in facades, sills and steps, as well as sidewalk “mounting blocks”. This sedimentary rock is truly a form of sandstone, made naturally in America’s Northeast by millions of years of the earth’s crust compressing sand particles into formations that percolate with iron oxides that give it distinctive color. Brownstone became hugely popular as an exterior veneer just prior to the Civil War, and most of Charleston’s brownstones are 1850‘s vintage, such as the 1853 bank building at 1 Broad Street. Brownstone cladding is typically a four-inch veneer joined by masonry to an inner wall of framing or brick, and is a stone that is easily cut because of its relatively soft nature. 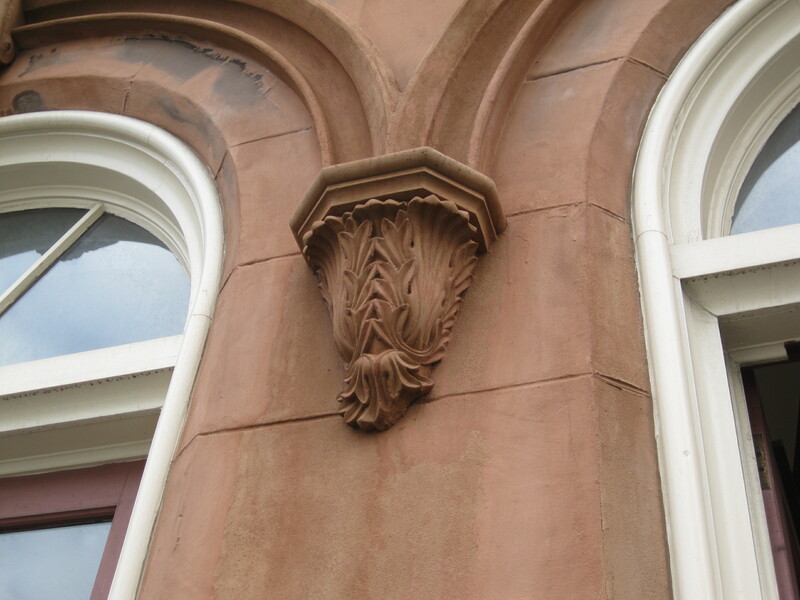 However, masons impatient to ship brownstone often cut it before it completely dried out, and to show off its color, it was often applied vertically, what is called “face-bedding”, both of which contribute to flaking (spalling) as water seeps through cracks and promotes breakage. Quite a few local brownstone window sills show evidence of spalling, probably due to the heavy dripping of water on stone that was hastily installed. The largest brownstone in the city is the Cathedral of St. John the Baptist, begun in 1890 as a replacement for its predecessor, the 1853 Cathedral of St. John and St. Finbar, which was the largest stone building in the South. Brownstone was so expensive that the newer cathedral was not completely finished, lacking a steeple until 2010, when the belfry was completed with composite brownstone.